A contemplative and beautiful release that begins with two acoustic guitars, and ends somewhere deep inside both hearts and minds. The long-awaited debut EP from accomplished acoustic guitarists Jonathan Nicholson and Gary Burris, AKA The Rising Tide. Morning's Promise is an album that explores many facets of the human experience, from the joys of relishing in healthy and happy lives, to finding brotherhood amongst close friends, to even trying to find hope in the midst of depression. This is an instrumental album that can find it's place as either mood music over coffee and conversation, or be the focal point to a focused listener. This might be music written and performed with two guitars, but it is far from being just guitar music for guitarists. "There is a man who, years ago, realized that his true calling in this life was to create and share music with the world. Never formally trained, and somewhat of a loner, he spent years reaching within himself and honing his art, with his guitar becoming his voice. In another part of the world there lived a man who, after working with various bands as a guitar-slinger, became disillusioned with his music. Retreating within himself , he too realized that his true calling was to be a solo instrumentalist with his guitar becoming his true voice. After spending nearly a decade watching each other from the wings, and repeated suggestions by close friends that a musical partnership could take their solo careers to their next level, Jonathan Nicholson and Gary Burris have finally joined forces. 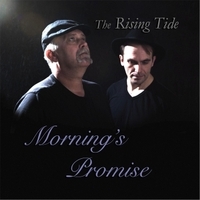 Coined as “two brothers from different mothers” Jonathan and Gary are … The Rising Tide! With decades of individual craftsmanship and skill now combined, The Rising Tide is a musical tour de force which will mesmerize you with their guitar wizardry!"